We Will All Be Screaming For Joy: The Ice Cream Man Brings Sweet Treats To Pop That Goes Crunch Radio | Pop That Goes Crunch! The blogroll to the right has long-included a link to the Ice Cream Man Power Pop And More blog. For the past several months, the Ice Cream Man has been rocking the world with a weekly radio show spinning the finest in Power Pop, Mod, 60s, New Wave and Northern Soul tunes for discerning ladies and gentlemen from his perch out in Sweeden. Now, The Ice Cream Man is coming to the US. Pop That Goes Crunch radio is happy to announce that it will be airing The Ice Cream Man’s weekly show twice a week for your listening pleasure beginning on February 14. You can catch it every Friday night at 7 PM Pacific Standard Time (10 PM on the East Coast), and every Saturday morning at 8 AM Pacific Standard Time (11 AM on the East Coast). What will you hear on this week’s broadcast? Tracks from The Cry! (about whom I wrote recently, right here), The Jam (a favorite of mine for more than three decades), Owsley, and The Surf School Dropouts, not to mention a bevy of Northern Soul, the “brutal garage R’n’B” of The Beatpack, the “Aggressive Pop Supreme” of Trees and Timber, the Missouri punk-surf-pop of Popular Mechanics and the “bubblegum Fowley worship garage pop rock” of The Ketamines. And much, much more! You can’t go wrong with that kind of eclectic line-up. 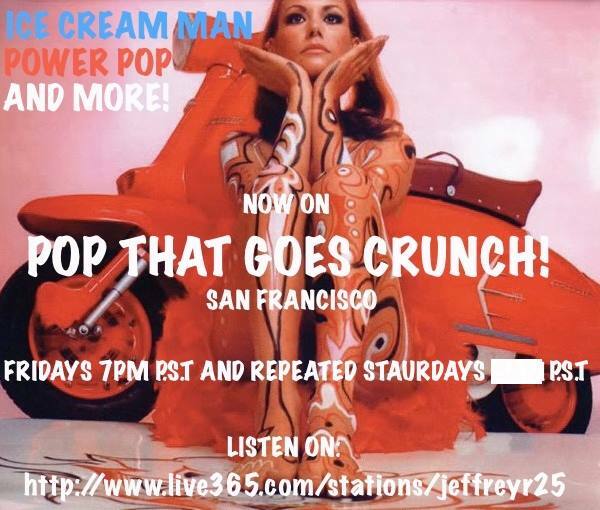 So take an hour out of your week and check out The Ice Cream Man on Pop That Goes Crunch Radio, right here, every Friday night and/or Saturday morning. You will be glad you did.